Window Safety Device Requirements – The time to act is now! The Strata Schemes Management Act was varied to require owners corporations to install window safety devices on both existing buildings and new developments. Simply, the change is to prevent children falling from windows. Owners Corporations must have devices installed on all common property windows above the ground floor by 13 March 2018. The safety devices must be robust and childproof. Owners’ Corporations must have such devices fitted on all common property windows above the ground floor to prevent children falling through them. All strata buildings in NSW must be fitted with devices that enable the windows to be locked at 12.5cm when the device is engaged. 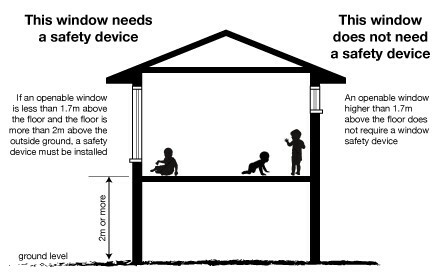 These rules apply to openable windows above the ground level that are accessible to children. If the openable window is less than 1.7 metres above the floor and the floor is more than 2 metres above the outside ground level, then a safety device must be installed. The window opening must be restricted to a maximum opening of 12.5cm. See diagram below. Will this mean the windows will never be able to open? No. Residents will still be able to open their windows. A window lock that allows the window to be fully opened, fully closed and also locked at 12.5cm complies with the legislation. When children are in the unit or townhouse, or on all common access areas such as stair landings, it makes sense to engage the locks at 12.5cm or less at all times to prevent falls. 1. Speak with your Strata Manager at Vital Strata Management. 2. Conduct an audit of windows in your scheme that will need a safety device to comply with the legislation. 3. Obtain quotes from qualified tradespeople. It is unlikely that a local handyman will have the suitable testing equipment to grant certification so stick with the professionals. 4. Select the quote for your purposes at a Strata Committee meeting. 5. Engage the selected tradesperson to carry out the work. The NSW Fair Trading Department has a lots of useful information, and we strongly recommend that you check whether your building is compliant. Have a look at their dedicated window safety page HERE. In case of any doubt, please check with your strata manager. The NSW Fair Trading Department fact sheet can be found HERE. The NSW Fair Trading Department has produced a series of short videos. Hit THIS link! If you need professional guidance on these matters contact Vital Strata today – We can help!